I'm at it again. Sub-zero temperatures and an endless week are the necessity of invention [for parents], I suppose. I wanted to share a couple of simple projects I did with/for my 4-year-old son. Here's the first one. It's called a Feely Box. It doesn't look too complicated, right? 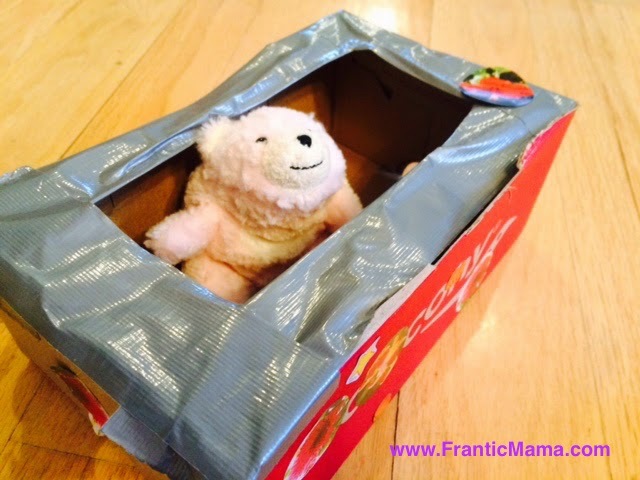 I hate throwing away shoe boxes (so many things we can do with them! ), so I had my son color his and put stickers on it. Then I used duct tape to make a flexible "top" for it (you still need a hand-size opening). We had fun putting different stuffed animals, character figurines, and miscellaneous trinkets in it, and we took turns keeping our eyes closed while trying to guess the object just by touch. Even my 2 year old [kind of] got the hang of it. Here's my second simple project. 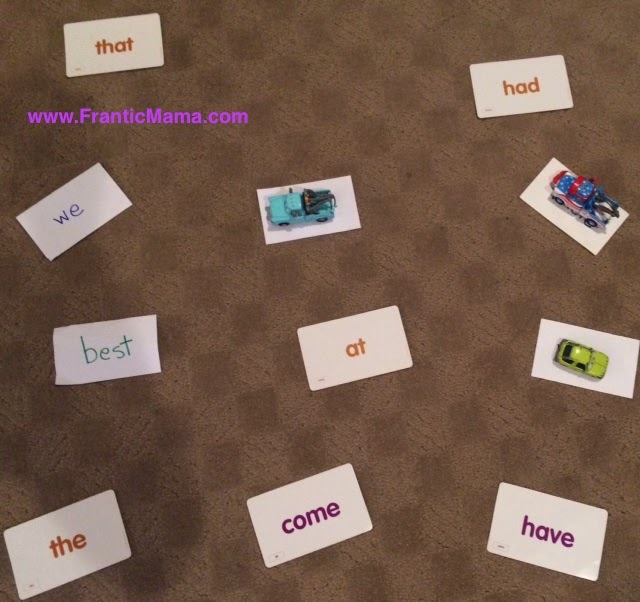 It's a sight word game I made up on the fly. We'll call it something spectacular, like "Words and Cars." I have a sight word deck I've been working on with my son for little bursts of time when he shows interest. He also loves cars. In this game, I spread out some of the words he knows; I then read a word on one of the cards and he had to put his car on top of the correct word. It was a fun matching game for both of us. The best part: he felt very successful and proud of himself. Last but not least, another cardboard project! In under 5 minutes, I created a little town scene for my kids using an opened box, markers, figurines, stickers, cars [of course], and items from a Michael's felt dinosaur scene set (that also had a volcano, trees, etc.). And that's all I've got, people! I hope it inspires you to find new ways to use 'stuff' around your house when you are cooped up with the kids for one too many hours/days/weeks. Need more indoor activities? I wrote a winter survival guide, here. What simple little projects have you completed recently? Let's connect! 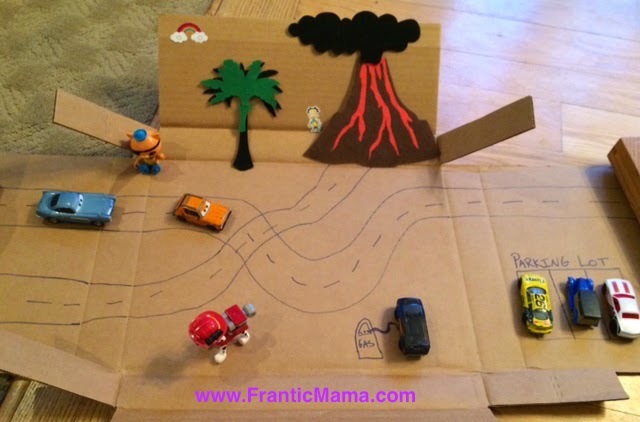 Frantic Mama is on Facebook, Twitter, Instagram, & Pinterest. I like your ideas as they are so simple to do! We have been learning about shapes and sounds so we used bubble wrap to do some painting - great effect, messy is fun (well sort of) and a good texture experience. Simple is my only option-- otherwise it all feels too overwhelming! Painting with bubble wrap sounds like fun. Maybe I'll give it a try!